What can we learn about data privacy from McGill’s past? In the IT Services meme contest, you decide! The theme for this year’s Data Privacy Day Livestream LinkedIn event is “A New Era in Privacy”, so we thought it would be fun to reflect on what McGillians from previous eras might have to say about data privacy. 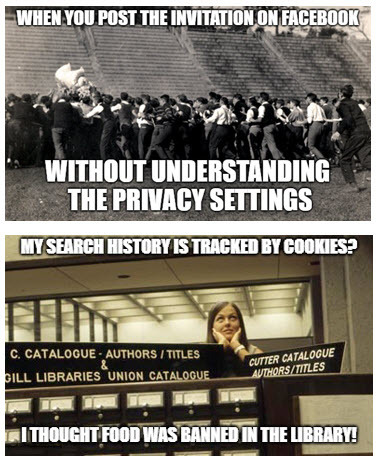 IT Services is hosting a contest to create a meme about data privacy using a picture from the McGill University Archives, or Yearbooks and we are hoping you can come up with something funny and smart. The winner will receive lunch for two at the McCord Museum! Use one of the images from the pre-approved set of photos that we have pulled from the McGill University Archives, or find an image by searching through McGill yearbooks from 1948 and earlier (to avoid copyright infringement). Create a meme* about data privacy by uploading your image to your preferred meme generator. Add your text to the image and save it. Post the meme in our Data Privacy Meme Contest group in Yammer (sign in with your McGill Username and McGill Password). NOTE: If you are not using one of the pre-approved images, make sure to include a reference to the yearbook that contains the source image, e.g. OLD McGill 1941. We will choose the top five and then open the voting to the entire McGill community. The meme with the most votes wins lunch for two at the McCord Museum! Contest is open to all students, staff, faculty and alumni. Members of the selection committee and their immediate family are not eligible. A maximum of two memes per participant will be accepted. Photos used must not violate any copyrights; use only pre-approved images, or images from Old McGill yearbooks. By submitting a meme, you confirm that the words are your original work. * Memes that are vulgar or otherwise offensive, or that disparage the reputation of an individual or group will be removed immediately and disqualified from the contest. Want to learn more about Data Privacy (and get ideas for your memes)? The more information you make public about yourself (and your friends and family), the greater your exposure to online threats such as identity theft, cyber-stalking and cyber-bullying.